Why are you so versatile? You never fail to make me smile! Avocados. Very few fruits provoke such strong opinions as an avocado. Seems you either love them or hate them. I grew up with a huge 30+-year-old avocado tree in my grandparents backyard. Now, being fairly Mexican you would think we ate guacamole everyday. Nope, not really. We didn’t wear sombreros either. Not very Cinco de Mayo of us, I know. We weren’t very festive. Ok, rant over. Annnnd breathe. So what if you aren’t quite game yet for chocolate avocado pudding, which is actually kind of good but aren’t a fan of guacamole – what to do? (Having a Winnie-the-Pooh moment) Think. Think. Think. When you break down an avocado it is a berry-like fruit with a giant seed. The seed is pretty much useless unless you are trapped on the 70’s and want to have avocado plants all over your house. Then by all means keep that seed and sprout it. And say hi to Denny Terrio for me. When an avocado is mashed it becomes more creamy. Creamy. Crreeaammyyy……..Smooth. Cream. Dairy. Buttery. Cream Sauce. 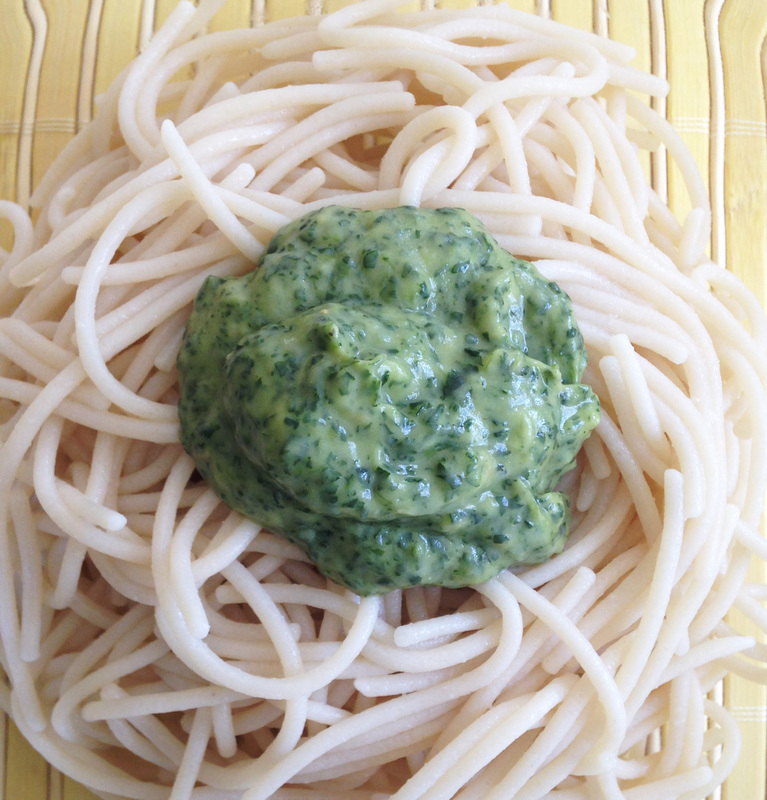 CREAMY DREAMY DAIRY-FREE PASTA SAUCE! There you have it. Oh, I guess there are a few more things you could add to your list. Which brings up an interesting quandary – you just can’t go out and buy ripe avocados, now can you? Most markets buy their avocados very green and it takes days for them to ripen. Or, they have ripened but are too mushy to use. The markets don’t like that at all. Once in a blue moon, you will hit the avocado lottery and the universe aligns and perfect avocados are to be found. Just in case that hasn’t happened yet, it’s better to be prepared than hungry. Buy a few avocados each week, they are inexpensive. Throw them GENTLY PLACE them in your pantry or cookware cabinet and let them do their thing for a few days. 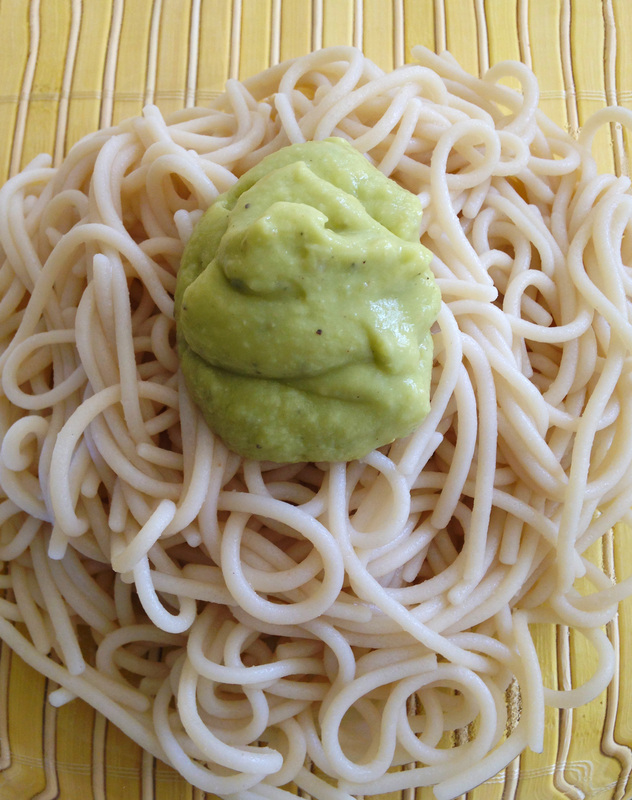 I promise you will use them – guacamole freezes well, they are excellent in smoothies, and as we will see, a great pasta sauce for those of us that can’t have dairy. So go buy some avocados already! 3 large avocados – only see tiny ones at your store? That’s ok, just buy a few more. 1 garlic clove, or equivalent in prepared minced garlic or even garlic powder! 1 tsp. lemon or lime juice, or even apple cider vinegar. A hand blender, food processor or blender. Or you can mash this into oblivion with a potato masher as well. And then a fork. And then smoosh it through a strainer/sieve and it will work. 1. Wash your unpeeled avocados with soap. Trust me. 2. Carefully slice the avocado in half, cutting through to the pit (seed) lengthwise. Remove the pit, and scoop out the yummy inside with a large spoon. Throw out those pits. No one grows houseplants anymore. 3. 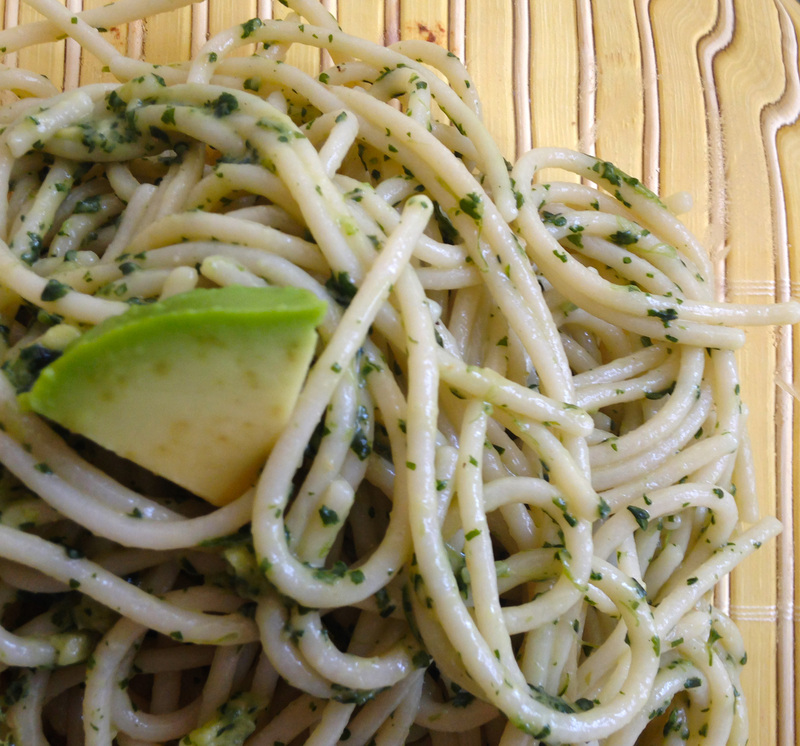 Place avocados in whatever they will be mashed in – bowl, blender, processor, etc. 4. Unpeel your garlic clove and put it through a garlic press. Put the minced garlic into the avocado’s bowl. Add in the milk, lemon juice and salt and pepper. Blend/mash/mix until you have a creamy sauce. It does not have to be runny, thick sauce coats your pasta better than runny sauce. 5. Now taste it. Does it need more of anything? Go ahead and add it. 6. Throw a big splurb on your pasta and toss. Yes, splurb is a totally technical term. Enjoy! It will keep for another day in the frig – just cut a small piece of plastic wrap and press it onto the surface of the sauce, covering it completely. This is a wildly delicious, flavorful sauce! 1. Wash the cilantro and remove the “branches” from the large middle stalk. . Pick off as many leaves as possible to use in the sauce. Leaving the little vines they are attached to is no big deal. 2. Follow all of the above instructions, adding the cilantro with everything. Add another garlic clove for a stronger taste – I love it this way! 3. 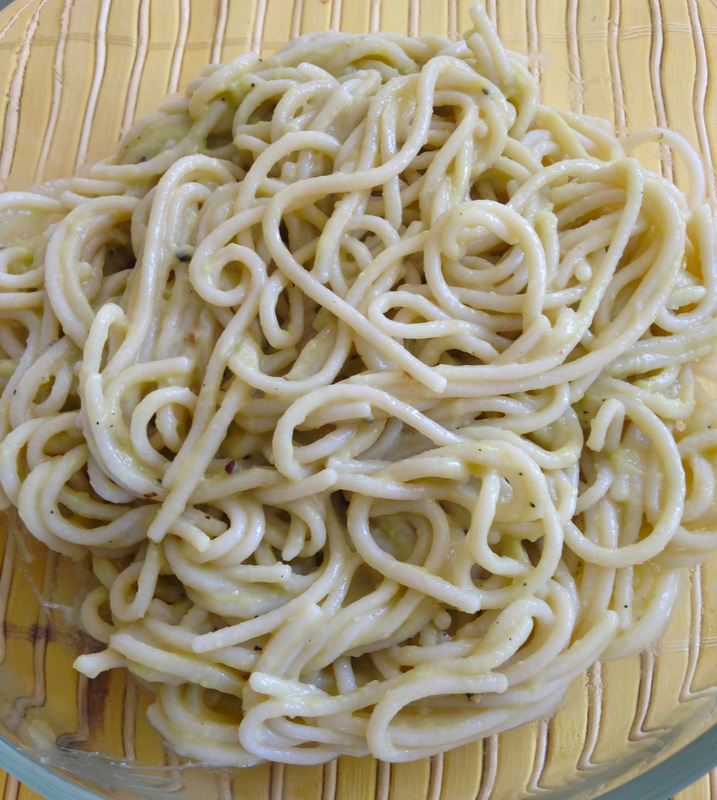 Toss with pasta and enjoy! Simple recipe + few ingredients = a happy tummy! See how easy and yummy avocados are to work with? This is where I can’t actually see you shaking your head yes, but I’m trusting you are. Stay tuned – Brainless Monday Meal (Tm) post coming in just 24 hours……..same bat time, same bat channel…….